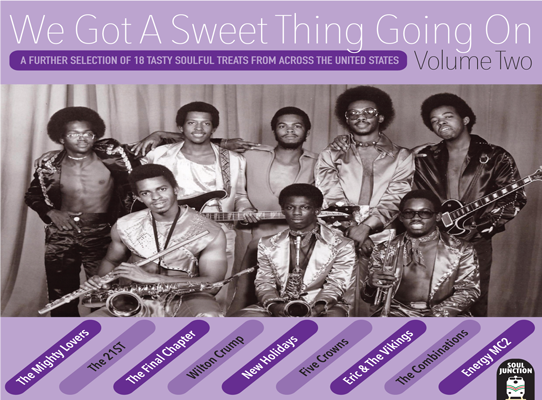 “We Got A Sweet Thing Going On” volume 2 carries on where volume 1 left off. Eighteen great tracks which all showcase the group harmony sound, well almost! We’ve thrown a curve ball into the mix on this occasion with the inclusion of an instrumental “Merry-Go-Round Of Love” one of three previously unissued tracks out of the four featured from the Milwaukee group the Final Chapter. As with the previous compilation a solo artist has crept in to rub shoulders with the group ensembles. Gary, Indiana’s very own Mr Wilton Crump who performs both sides of his mellifluous solitary 45 single “Think It Through” and “Give Your Love To Me” released on his own Olive Branch label. Solo artist or group if it sounds right then it feels right. The Motorcity is heavily represented on this compilation with three acts from legendary producer Richard ‘Popcorn’ Wylie’s Soul Hawk stable. Firstly by The Mighty Lovers, with their highly sort after “Ain’t Gonna Run No More”(previously issued on a Soul Junction45, SJ1002). 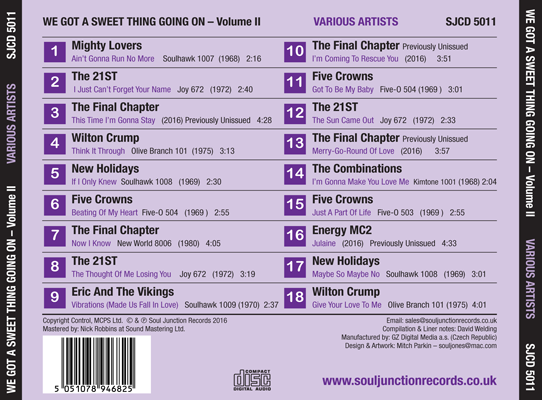 The Mighty Lovers voices can also be heard although un-credited as backing vocalists on all of Jimmey ‘Soul ‘Clarks Soul Hawk sides as well as providing the rhythmic hand clapping on his “If I Only Knew Then (What I Know Now)”. The second of Popcorn’s acts featured is Eric & The Vikings with their harmonious million seller, “Vibrations (Made Us Fall In Love)”, followed by The New Holidays with their currently popular “Maybe So, Maybe No” .Aldo featuring it’s excellent flipside, a great cover version of Jimmey ‘Soul’ Clark’s previously mentioned “If I Knew Then”. Fellow Detroiters The 21ST have all three of their recordings made for Joe Terrell’s Joy label featured, “I Just Can’t Forget Your Name” released twice with two different flipsides “The Sun Came Out” and “I Just Can’t Forget Your Name” all featuring Willie Jones later of the group ‘McArthur’ on lead vocals and label production credits that feature some of the motorcity’s finest. The final Detroit act is Energy MC2 with their previously unissued sweet soul outing “Juliane”. MC2 began their performing career as a energetic bunch of kids under the name of ‘Congressional Funk’ who by their mid teens had become The Soulful Hounds who not only recorded “Why Did You Leave Me Girl” for Ernest Burt’s Magic City label but would feature on many of, Mad Dog & The Pups and Sweet Geraldine’s Magic City releases. Later some of the band members joining Ray Parker Jr in forming the band ‘Raydio’ while some of the other members becoming part of the band for ‘Parlete’(part of the P-Funk family) helping George Clinton land the Mothership! N.B. (Two further previously unissued Energy MC2 songs are due for a vinyl 45 release later in the year, catalogue number SJ536). The Windy City is represented by The Five Crowns with their local hit “Just A Part Of Life” and both sides of it’s follow up release “Beating Of My Heart”/Got To Be My Baby” unusual in the fact that it is two different songs recorded with both using the same backing track!, all three songs were composed by Chicago wordsmith’s Gerald Dickerson and Charles Boyd and produced by former Trends (ABC) group member, Emmett Garner Jr. Mastered by: Nick Robbins at Sound Mastering Ltd.
Compilation & Liner notes: David Welding.